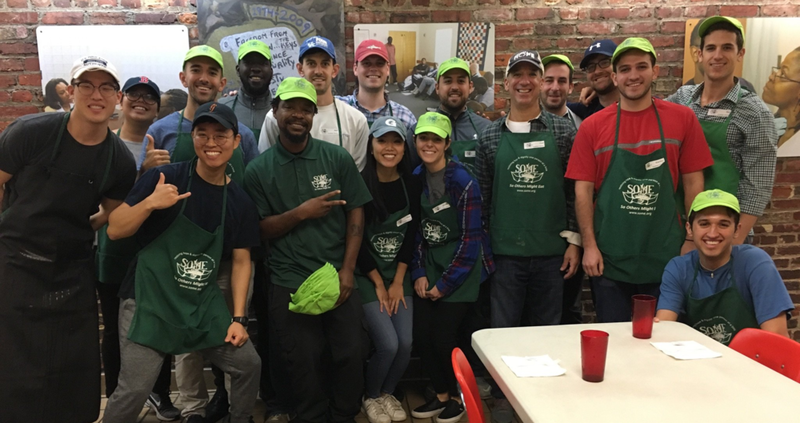 Earlier in October, our team had the opportunity to volunteer at an organization known as SOME, So Others Might Eat. At its inception in 1970, SOME’s goal was to provide meals to the poor and homeless in Washington, DC. Since then, the organization has evolved into so much more, offering a range of services focused on bettering the future of those with little to no resources to do so on their own. In addition to serving the immediate day-to-day needs of the homeless in DC, SOME is able to provide health care, employment training, long-term housing, and more. To take their initiatives a step further, SOME is currently raising funds for a 320,000-square foot facility to become the first in DC to offer these services at a single location. This facility will change the way the 8,350 homeless men, women and children receive assistance, making it even more accessible. SOME is a fast-growing organization that is actively changing the lives of thousands of people. We are grateful that Team Services was able to take a small part in their efforts! Volunteering during SOME’s breakfast, we saw around 350 people come through the doors for a warm meal. With 3 services each meal, SOME is able to feed hundreds of people a day, and they’ve perfected their system to make that possible. With volunteers arriving at 6:30 AM, the usual staff delegate the volunteers to four stations to help get the dining room ready for the meal service: serving, preparing coffee, setting the tables, and rinsing the dishes. When the guests begin to arrive, everyone is already in place to ensure that things run smoothly and there’s a quick turnaround for the next group. We had six Team Services staff plating the food with a couple of other volunteers, two staff members with our principal Fred Fried walking the aisles pouring coffee, and one of our interns joining another group of volunteers to help with the dishes. Once a group of visitors finished their breakfasts, we all broke out of our assigned jobs to assist with flipping the room for the next round. As newcomers, it was great to meet so many people that have been volunteering at SOME for years and see the value in giving back to the community. It’s important to be aware of the need for volunteers at such organizations because without them, the services they offer simply wouldn’t be possible. All of us at Team Services unanimously thought it was a great experience, even if some of us had to wake up at 4:30 am to get there! Team Services had such a great experience volunteering last month. We are currently planning to visit again during December as we ring in the holidays, and we look forward to returning to our new friends at SOME! The Team Services crew after the morning rush, joined by SOME staff and a handful of new volunteer friends from Georgetown University.